As the boys are too excited to sit still, one beef delivery is made, and the monthly beef order drop off is postponed a weekend, we start to prepare for the snow and cold temperatures that are forecast for our area. Bobby starts up that tractor and puts out hay to all the livestock. The boys and I clean out horse stalls, lay down fresh bedding, and get the horses settled in their stalls for the snowy night ahead. All exposed water pipes are insulated or turned off and drained. The trucks get plugged in so they will start in the morning. 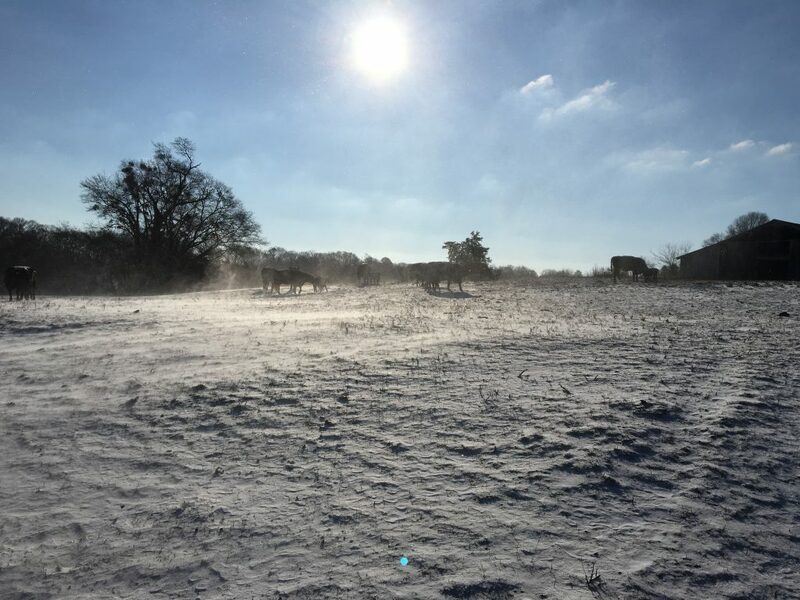 Snow is not so bad; it is the cold temperatures that are so hard on us and the livestock. It’s not like living up north when snow is regular for farmers. After all, last week, we were in the high 60’s, and then this morning, it is a wind chill of 8 degrees! And it is not a nice insulating, fluffy snow; it is more like watery, ice snow. Then, the forecast has our area in the 60’s again two days later. So while we have to prepare maybe three times a year, we are not in constant preparation like up north. The boys go to bed just as the snow starts to fall! We wish we could bring in all the livestock and give them warm bedding, but I have to remember, they are made to handle these conditions. 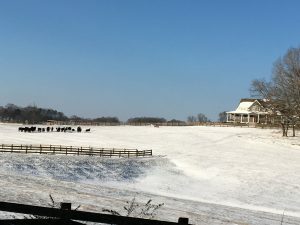 Since the first of December, they have been putting on a thicker coat, and we have been faithfully feeding them hay to keep them in good condition. As we wake before the sun comes up, we can already tell from what little light is out, there is a blanket of snow. We drink a few cups of coffee, let the sun get up, and start the day’s chores. When there is snow on the ground, it takes more time than usual, and there is a lot more to do. That means layers of clothes. 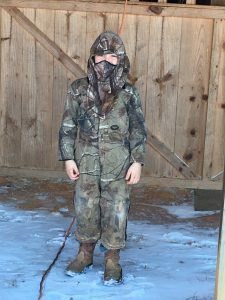 While it is easy to find the adult’s clothes, hunting down the warm socks, thick gloves, and thermals for the boys is a task. We try to have a place for everything, but with boys, they tend to forget where they took them off last. Now that we are all bundled up, we waddle out to the truck. Bobby has already warmed up the truck for us. 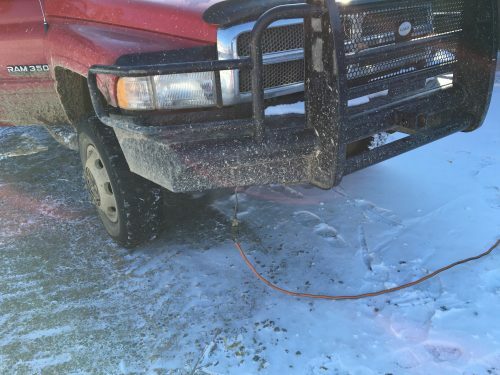 It is so cold, the truck doesn’t get quite warm enough. Since we have so many layers of clothes on, the heat would burn us out of the truck anyway. Second chore: Check all the cows. This time of year is the largest calving season. 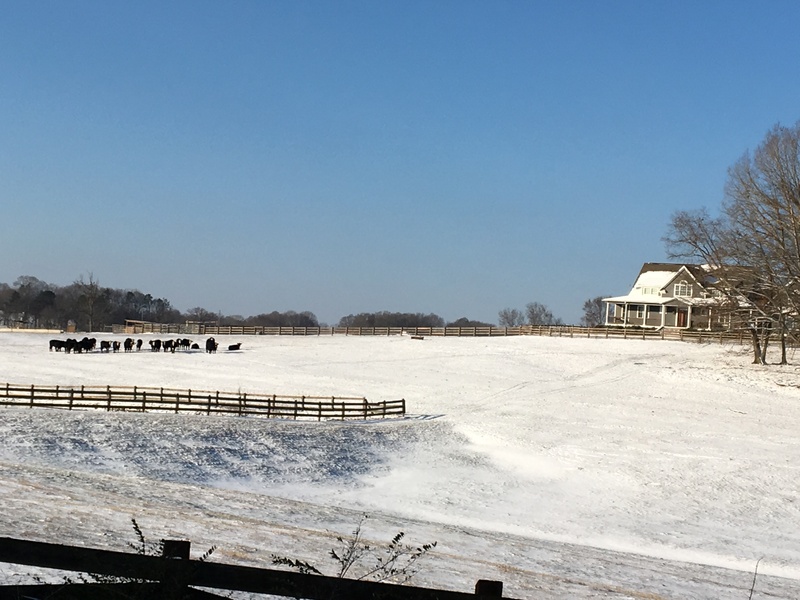 We try to keep the cows that are calving at the house, but as we have grown over the years, we have cows just a little further out than just around the house and across the road. The roads are SLICK this morning. We figured it would be icy on our little country road, but we thought the main road that goes to our river bottoms would be salted. They had been salted, but still icy. We all buckle up and drive slow! Third chore: Make sure all the cows are with their calves. Luckily, we didn’t have any calves in the cold night. 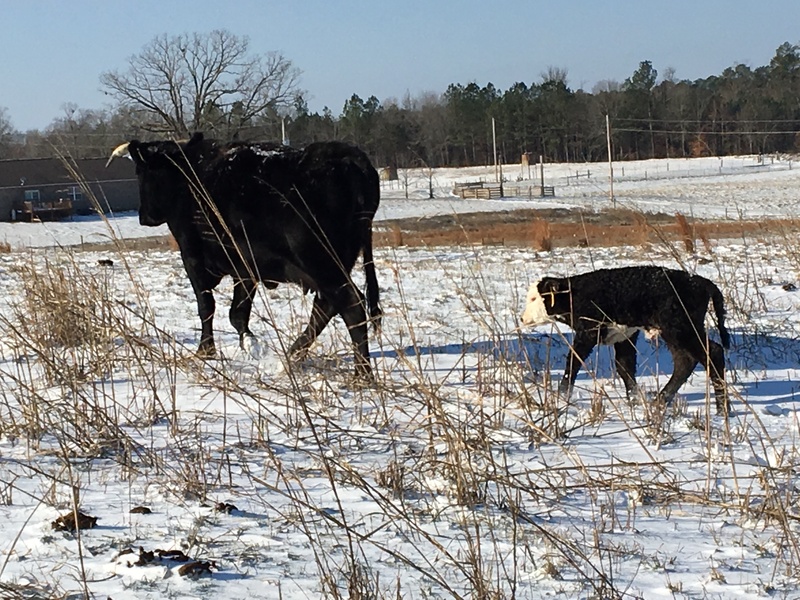 It is always hard on calves when they are born in freezing temperatures. If the mama does not clean it up, its body temperature will drop. The calf will not want to stand up and nurse. 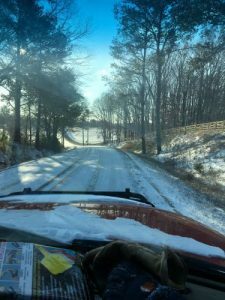 We have had many mornings with a newborn calf in the floorboard of the truck with the heat on full blast trying to warm a little calf up. Thankfully, this is not the case this morning. Fourth chore: Check all water troughs. 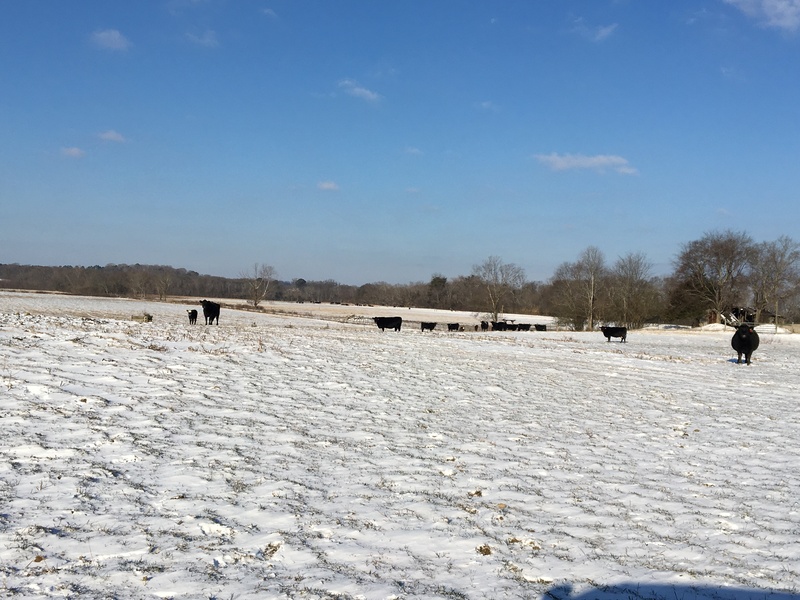 We try to install frost proof waters in as many pastures as we can. 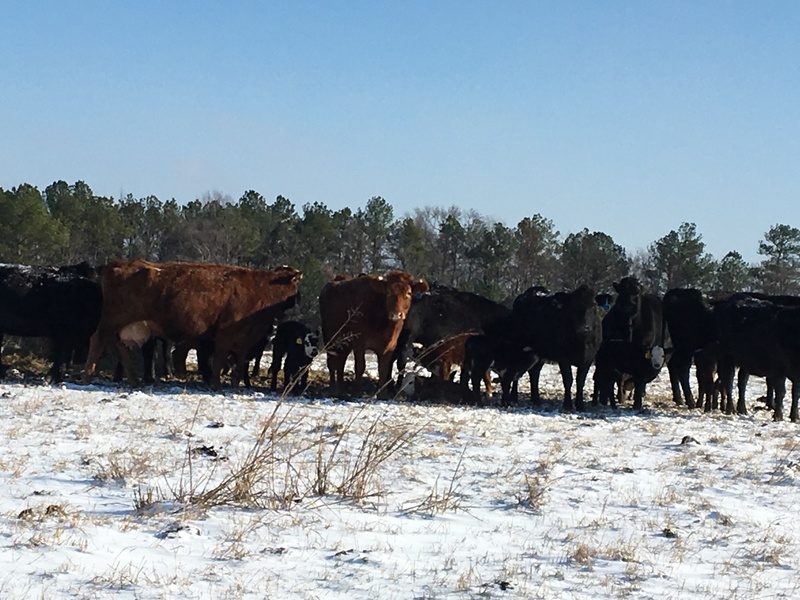 But, where we have a large number of cows in a rotational grazing pasture, we want them to have easy access to water, so a large open water trough works better in those pastures. 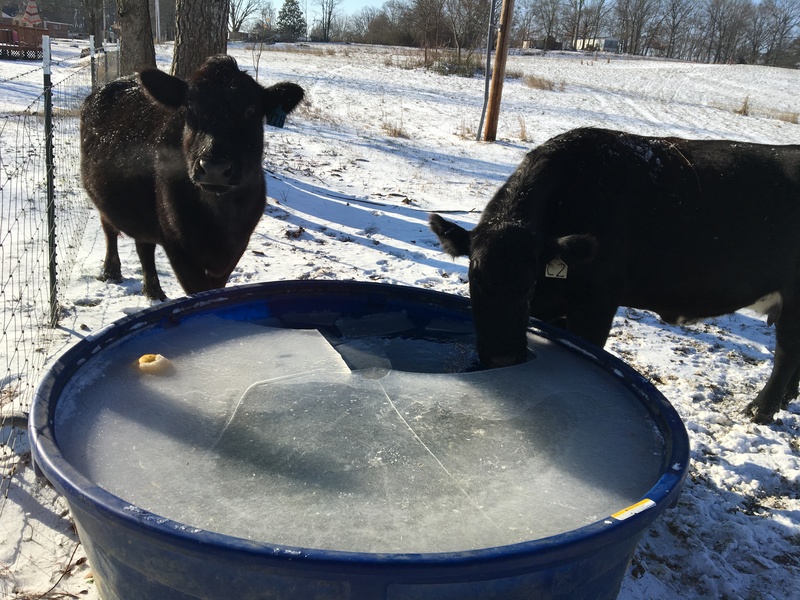 Big open water troughs mean breaking ice! This morning is not bad, but since the weather does not predict the temperature to get over freezing, the ice will get thicker and thicker making it harder and harder to break. We have to use an ax in some cases. If the pipe freezes and the troughs are not filled up, we have to find a way to get them water. Sometimes we truck water in with containers. 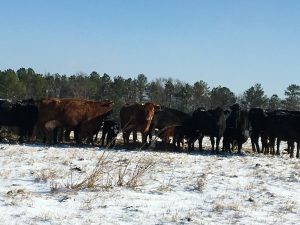 Others, we will open the cows up to creeks or ponds that we keep them fenced out of. 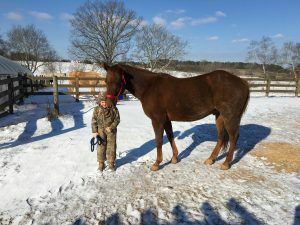 Fifth Chore: Turning out the horses. We give them feed while we check the cows, and then turn them out when we get back. They enjoy the room to stretch their legs, and the warm sun on their backs. Then we get to clean up after them. Sixth Chore: Eat lunch, write this article, and start all over again before dark. This is just a little taste of our cold snowy day. 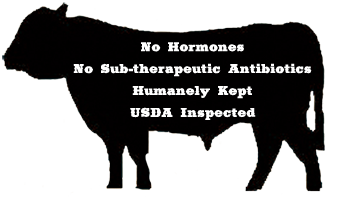 Bobby, the boys, and I are so thankful we have the opportunity to care for all the livestock we own. We are thankful for the challenges that are presented to us as well as the benefits we receive from all our hard work.